Music: Comfort food = comfort music. Jammed out to “The Big Chill” soundtrack while cooking up this meal. We have the soundtrack on vinyl, ohhh yea. 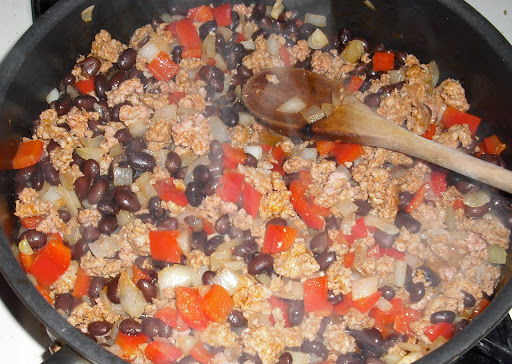 And for a simple and easy recipe like this…it makes dancing easy to do in the kitchen. If you can listen to The Big Chill and NOT dance…well…I don’t think we should be friends anymore. Menu: One bowl meal. A dark beer would be an excellent addition. Try 90 Shilling from O’Dells Brewery in Ft. Collins. There are many foods and ingredients that I’m a sucker for and I highlight them often in this blog. Leeks, artichokes, risotto, Indian food, homemade pasta are on the top of my list. Pumpkin is definitely on the short list. The excitement of Fall/Winter is partially because I know there are many cans of pumpkin puree to come! We always make pumpkin cheesecake, pumpkin bread, and this recipe has been officially added to our repertoire. I’ve heard roasting and pureeing your own pumpkin ain’t all it’s cracked up to be. However, a good friend of ours visited a while back who’s a pastry chef back in Baltimore (what up Doug!) and he says I gotta give it a try. Maybe next year, I will tackle my very own pumpkin! In a large skillet, heat EVOO and add chorizo. Cook and crumble until almost cooked all the way through.Scoot to side of pan. 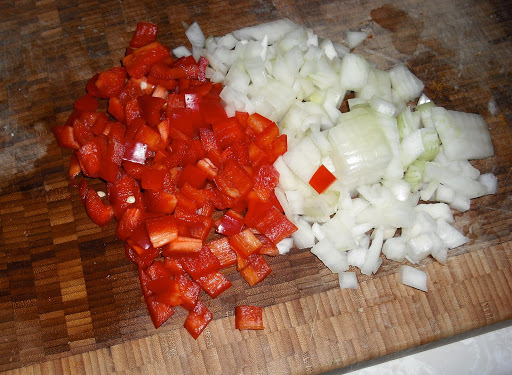 Add onion and bell pepper to open side. Saute until soft and translucent, about 10 minutes on medium heat. While meat mixture cooks, heat stock and milk to a boil. Add pumpkin puree. When the liquid reaches a simmer again, gradually whisk in polenta. Continue to stir until fully incorporated and cooked about 5 minutes. 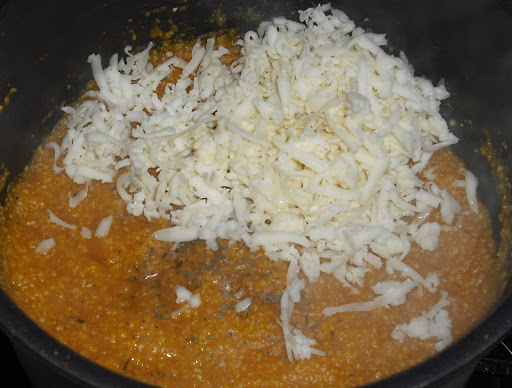 Turn heat off polenta and add cheese and thyme. Stir to incorporate. In a bowl, pile a heap of polenta. Top with chorizo mixture. Garnish with seeds and cilantro if desired. 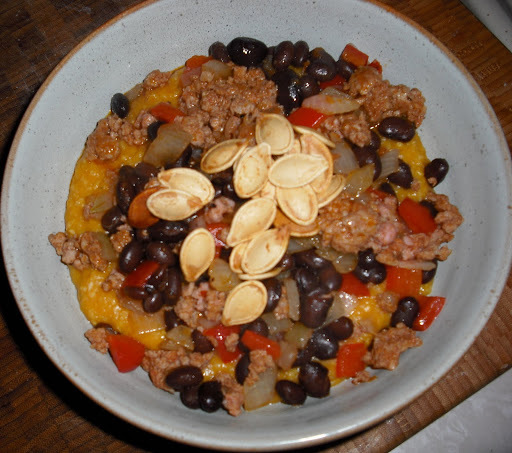 This entry was posted in dinner, easy, Mexican, pumpkin by callywoodfarms. Bookmark the permalink.